A cookbook for kids giveaway. This cute book is made to help you teach your kids to cook from the ground up. You start off simple by showing them how to crack eggs and measure flour and work up to teaching them how to get something hot out of the oven. At the top of each recipe, there is a picture of a kitchen tool (blender, microwave, oven, etc. . . ). So you can quickly glance at the recipe and see if your child will be able to handle it by themselves or if they will need a little adult help. There are super simple recipes and there are more involved recipes. Special Day Ice Cream Cake. This time, I chose to try the raspberry cream cheese spread. This recipe requires no adult help. 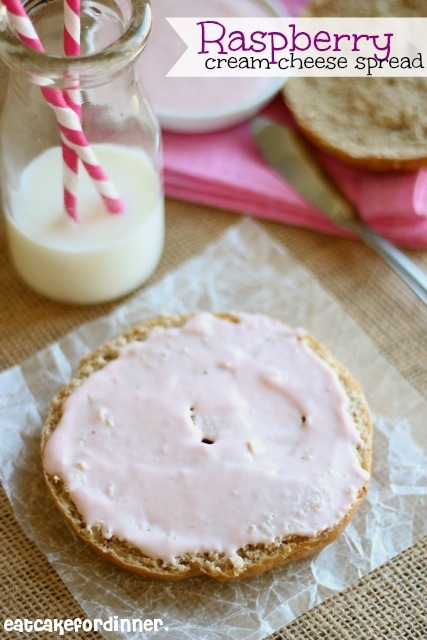 I love me some bagels and it never crossed my mind to make my own flavored cream cheese spread. It was so easy and it was seriously DELICIOUS, not to mention a lot cheaper than store-bought flavored cream cheese. Overall, I think this cookbook is fun and easy to follow. If you are interested in showing your kids how to cook, then this is the perfect way to get them started. In a small bowl, mix together the cream cheese, jam and powdered sugar until smooth and creamy. Serve on bagels or toast. Simply leave me a comment on this blog post with your favorite "kid food." If you don't have a favorite kid food, just tell me your favorite food. If your name does not link me to a blog, be sure to leave your email address, so I can contact you if you win. Good luck. Bonus Entries (not mandatory): Follow Eat Cake For Dinner on Google Friend Connect, Facebook, Pinterest, Google +, email and/or Bloglovin'. All are found on the right hand side of my blog. Leave me a separate comment telling me which way you follow. Giveaway will end on Friday, June 14th and I will announce the winner on Saturday, June 15th and contact the winner via email. Winner must respond within 72 hours or a new winner will be selected. The publisher provided me with a copy of this cookbook, but the opinions expressed herein are my own. My favorite kid food are little ice cream cups-the individually packaged ones like we had at birthday parties growing up. Stopping by from "Mop it up Monday"! This looks like a cute cookbook! =) My favorite kid food would be pancakes with Peanut Butter. My kids love macaroni & cheese with hot dogs!! My favorite kids food is Homemade Mac and Cheese with chicken strips. My favorite kid foods are hot dogs and mac and cheese! I follow you on Pinterest and by email. My favorite kid food is popsicles! My Favorite "kid" food is any food that "the kids" (grandkids) prepared. That usually involves cupcakes with cherries hidden inside. Thank you and God bless! I follow on emails from you. Recently tried the chocolate and rice Krispies thank you, that was because you thoughtful and kind father surprised you with a new cookbook. This weekend I made some of your bread (shared with our ill neighbors) and am now wanting to conquer lunch lady rolls!! Love your fun site and your website title is pure joy!! Do you have a cookbook available?!?! Please let me know! Frozen smoothie pops! Absolutely adored by everyone in the family! LOVE peanut butter and jelly sandwiches! My favorite kid food is rice krispie squares--they're easy to make and kids of all ages like them. Thank you. Right now my favorite kid food is veggie soup puree! favorite kids favorite food is what they like to call white mac and cheese. My favorite kid food is PB&J. What a neat cookbook, my daughter would love this! My favorite kid food would have to be mac n cheese. I love pizza...like most kids! My fave kid food is grilled cheese! Yum! My favorite kid food is Pizza, but I like it with lots of veggie toppings. When I was a kid my favorite food was vegetables. No joke. I was weird. Now my favorite "Kid Food" is probably veggie straws. Those things are good! I would love to have this for me and my son so he can be more of a help and less of a distraction in the kitchen. My favorite kid food is chicken fingers with dipping sauces!